With a TOPCAT, it’s full speed ahead into fun in all directions. And thousands of TOPCAT sailors have been following this motto ever since 1979 on oceans, seas and lakes across the world. TOPCAT follows the philosophy that having fun sailing should be the top priority. TOPCAT’s principles are SIMPLICITY, SAFETY, QUALITY, and especially LOADS OF FUN for the entire family. Almost all of the TOPCAT spare parts and accessories are manufactured in Germany and Europe. The close cooperation with suppliers and continuous improvement processes ensure we always deliver the highest quality. TOPCAT hulls are unsinkable. All standard TOPCAT models also include a righting line integrated in the beam as well as a practical roller furling jib. 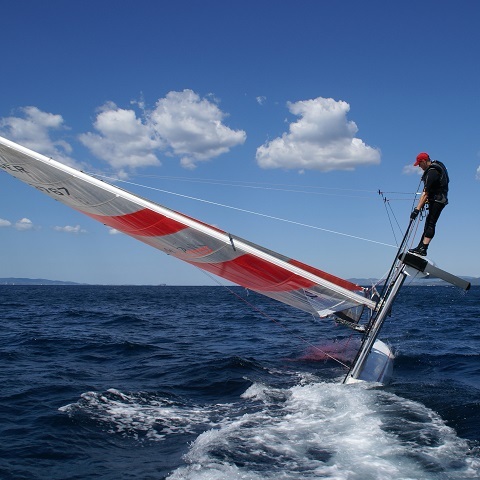 The lightweight aluminium mast has enough buoyancy to keep it from turning upside down, and the TOPCAT righting and boarding aids help you to right the boat and get back on board quickly after capsizing. Keels, booms and dangerous dolphin strikers are purposely left off of all TOPCAT catamarans. Catamarans achieve top speeds, and on some courses they can even move across the water twice as fast as monohull boats. The TOPCAT rudder blades can be lowered entirely to achieve the highest possible speed. The patented protection against running aground ensures that the rudder blade is raised automatically if contact is made with the bottom. That way damage to the hull and rudder system is avoided altogether. When landing, the TOPCAT rudder blades are brought into the beach position with a single pull. The cat still has full steering control, and the sailor can manoeuvre as needed to shore. All TOPCAT sails are purposely designed to eliminate the need for a boom. 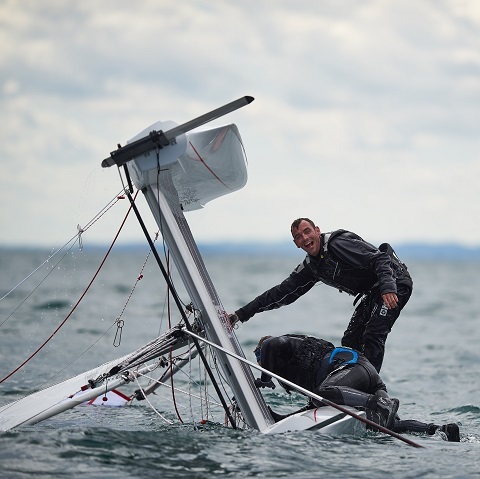 Sudden changes of the wind direction or steering errors can lead to undesired manoeuvres, such as unexpected jibes. In order to ensure that neither crew nor boat is exposed to serious danger, the mainsail of the TOPCAT is trimmed using only the batten tension and cunningham. In general, the more wind and the more tightly the sails are trimmed, the flatter the sail becomes. They’re not called dolphin strikers for nothing. The simple snap-on design of the TOPCAT catamarans eliminates the need for dangerous dolphin strikers. A real advantage during assembly, by the way, since nothing has to be laboriously screwed or adjusted. The platform stands alone by virtue of the trampoline tension. On the water, the forces of the rig are used to create an extremely stiff hull/beam connection – without the need for screws or bolts. Sailing is a recreational sport - best for the whole family. 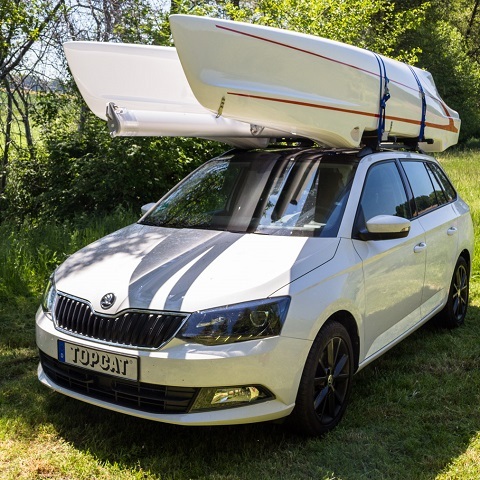 That’s why MOBILITY and FLEXIBILITY are a top priority at TOPCAT: whether for regatta sport, sailing to swimming spots or simply cruising on a family holiday. Thanks to the simple snap-on connection system, a TOPCAT can be assembled and disassembled in a very short time. When the mast is separated, the K3 and K4 models can be transported on the roof of your car without a problem. And the larger K1 and K2 models can easily be strapped down to the trailer without worrying about dangerous overhang. By the way, TOPCAT offers optional 2-part masts for all models. That makes it easy to stow the cat in the garage over the winter instead of having to pay storage fees to someone else. Since 1979, the German company with a long tradition has been a family-owned business. TOPCAT customers benefit from their personal high standards and the quality that naturally follows. The availability and reliability of consulting and training services are the norm at TOPCAT. Thanks to the high quality of workmanship and continuing development of the catamarans and their components, the TOPCAT catamarans have an enormous stability of value. Consequently, used TOPCATs are not only scarce, but also they achieve a high price on the market even after many years. The TOPCAT hulls are manufactured in a shipyard in Italy using the time-consuming hand lamination technique. The fibreglass hulls with laminated ribs and stringers have reinforced keel and beam areas. The decades of cooperation produce a consistently high standard of quality of the hulls. 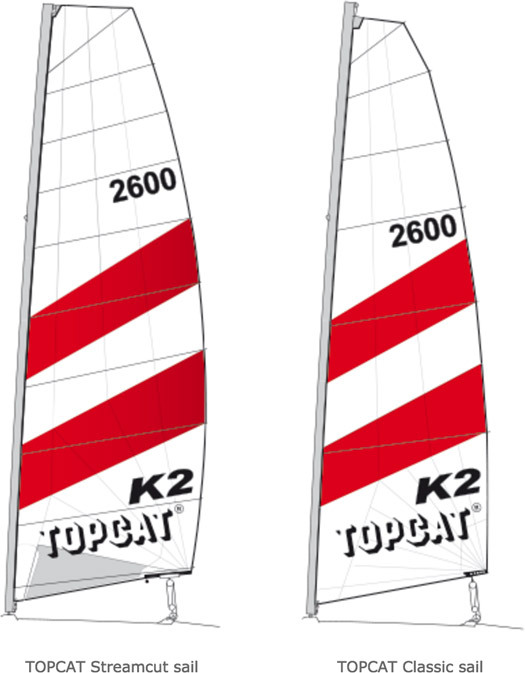 There are three sail configurations for all TOPCAT K-models: CLASSIC, STREAMCUT and REGATTA. The CLASSIC sails made of Dacron sailcloth provide sufficient sail area for the beginner or for sailing school purposes. Dacron is a sailcloth with high UV-resistance and a tendency not to crease. In addition to the sail battens, the clew has 5 adjustment options for trimming the sail. The STREAMCUT configuration - either Dacron or Pentex - has a wide-flared top and, depending on the model, up to 2.5 m² more sail area than a CLASSIC sail. 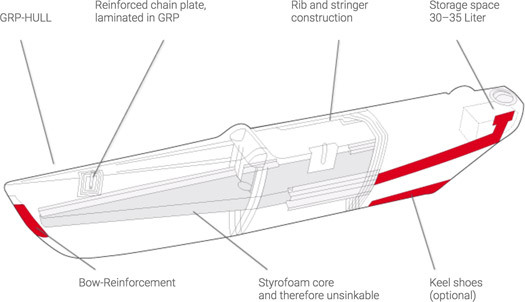 In the REGATTA configuration, the streamcut from Pentex is preferred. Pentex sails have low elasticity due to their material properties and, therefore, are more stable than Dacron sailcloth. 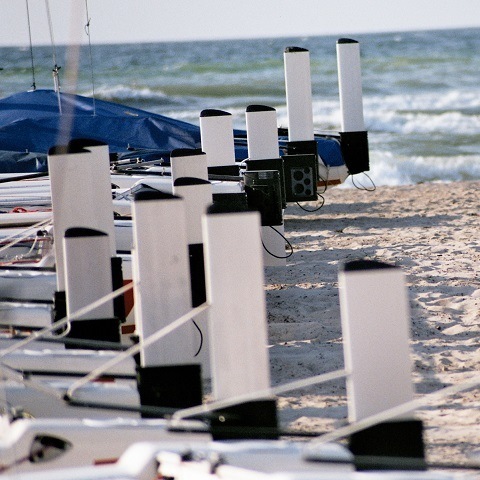 All Pentex sails and gennakers from TOPCAT are made in Germany. Depending on the course and the force of the wind, streamcut models are trimmed by means of the TOPCAT traveller at the foot of the sail, the sail battens, and the cunningham. Within the individual TOPCAT types, retrofitting can be done at any time. A sophisticated principle of interchangeable parts ensures that individual replacement parts are compatible and can be replaced economically. The smart spare part policy at TOPCAT guarantees end-to-end processing of orders and worldwide shipping within a very short time. Years of experience in international sales make TOPCAT a reliable partner - worldwide!